We treat our pets like family during their lives, so why not give them the same dignity in the afterlife as we would a human relative? This is a pretty common sentiment in today’s society, but it’s actually nothing new. In fact, the country’s first pet cemetery opened right here in New York, and still to this day is the nation’s largest such burial ground. Hartsdale Pet Cemetery was established in 1896 by NYC veterinarian Samuel Johnson (an early promoter of the ASPCA), who provided part of his apple orchard at his Westchester retreat to serve as a burial spot for a client’s dog. 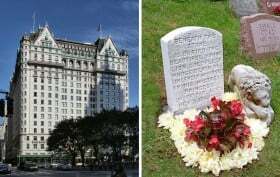 Now, nearly 120 years later, this area is the resting place for more than 80,000 pets, from dogs and cats to reptiles and a lion cub who called the Plaza Hotel home. Known as “The Peaceable Kingdom,” the grounds are also home to a 50-ton above-ground mausoleum for a pair of spaniels and the War Dog Memorial, a post-WWI tribute to military canines that was the first of its kind. Even Diana Ross, George Raft, and Mariah Carey have buried their four-legged friends here.